Perhaps the most intriguing novelty of living in a relatively small town in rural Japan is the fact that I am a celebrity. Every where I go people notice the white guy and with the exception of three people (one lady at the grocery store, one guy at the 8th station of Mt. Fuji and a guy at the base of Fuji) everyone in Japan is very nice. Well, I am sure there are a few more not so friendly Japanese people I am yet to meet, but for now we won't worry about that. I defnitely take for granted my newfound noteriety and it is not until I go to Tokyo for a weekend that I realize how good I have it in my town of Muikamachi. You see, in Tokyo there are more than just a handfull of foreigners and well, I guess I don't stick out so much in the big city. A smile in Tokyo doesn't elicit the same giggly response that I have grown to love in my town and each time I go to the big city it is not long before I yearn for the attention I get back home (home being Muikamachi for future reference). Now, if I may, I would like to relate to you a story of what happened to me last week and perhaps I can shed some light on the title of this blog, which I am sure has piqued the interest of one or two of my faithful readers (thanks to both of you for your support, by the way). Last week was the week of the school marathon. In fact, Thursday of last week was the actual day of the marathon. I shouldn't have to point out to you the significance of that date as last Thursday was September 22. Actually, now that I think about it that date really has no significance that I can think of, however, it did mark the day that I ran my first significant distance in probably 10 years. That may sound sad, but I truly despise cross country running so I avoid it at all costs. I would rather be doing practically any other activity to build up my cardio (usually riding the bike or playing some sport), but please, please don't make me run. Anyway, the PE teachers at my school thought it would be a good idea for me to run so I incomprehensibly agreed. I was under the impression that all the staff members would be running. After all, all of the students were required to run so naturally the staff would run too, right? Ah, Dean, so naive. In fact, I was the only member of the staff that ran and I still believe that I was the victim of a practical joke. Yeah, well I'd show them. Wait until they saw how I ran. I would earn their laughs, yes, but then I would earn their pity and then I would have the upper hand (does this logic sound as strange to you as it does to me?). Anyway, I know I said marathon, but it was really only 5.5 kms. There were some pretty good athletes there and the top time for the boys was 16 minutes, 40 seconds. My time was about 17 minutes 30 seconds (give or take 10 minutes). Actually, I am pretty happy with my showing and I guess it is true that raw talent really shines through when given the chance. Oh, despite the fact that I didn't completely embarass myself I can promise you I won't be doing anymore stupid long-distance races in the foreseeable future. Give me a rowing machine or something - anything but running. Ok, ok, I will get to the good part. It is customary in Japan for teachers to celebrate a momentous event such as a marathon with a drinking party. This wasn't a full-staff party, but was more for the PE staff and a couple others. By motive of pity or for entertainment they invited the white guy to the party (I am the white guy, in case you didn't get that). So, there were 15 of us and we were honoured enough to have the principal and vice principle join us for the party. That was cool, even though I didn't talk to them by virtue of a certain language barrier, but it was nice that they decided to come. Anyway, the boys sat on one side of the table and the ladies on the other. I had met most of the teachers before, but I remembered well below half of their names so they all had to be reintroduced to me (and I promptly forgot their names again ... whoops). The thing that was interesting about the introduction was that they made it very clear to me which of the women were single. It was like, "Dean this is so-and-so-san and she is single!" That was amusing. Anyway, after that the emphasis was on drinking. No, I am not talking about drinking milshakes and soda-pop. This was more drinking-drinking, like they do in the western movies. Actually, it wasn't as bad as I heard and it was mostly just beer. I don't mind having the odd drink, even though I have a strong distaste for alcohol, aside from the occassional glass of wine, but the big issue for me at this meal was the food. Upon my arrival, I sat down and was promptly served raw snails (which you had to fish out of their shell with a toothpick and then spit out the "foot") as well as raw squid in an squid ink bath. Fortunately, I knew what I type of restaurant I was going to and ate the biggest plate of spaghetti I had ever had in my life immediately before going to the restaurant. My excuse: "I thought it was just a drinking party, not a drinking & eating party ... whoops." I am sure it will catch up with me, but honestly, they did not want to see partially digested spaghetti all over the place. I was looking out for their best interests by not eating. So, later in the evening one of the PE teachers informed me that one of the Social Welfare teachers wanted to talk to me. I must admit that she is the cutest teacher in the school so I obliged and she came to sit next to me. In all honesty, I have no idea if she wanted to talk to me or not, but the PE teacher didn't really give her a choice - he was determined to hook me up with one of the Japanese teachers. I decided to play along. Anyway, after about 5 minutes of strained communictation (to say it was broken English and broken Japanese would be very flattering) some of the PE teachers who knew a word or two of English (I think 10 at most) asked the social welfare teacher if she would marry me. I was somewhat surprised to hear her say yes so when they asked me the same question, I just blushed and said, "Aw shucks, why not?" So, I am engaged. All I know at this point is that we are looking long term and probably won't be making it official for a couple years. I also made her commit to getting married on a Saturday. So there you have it, me and the cute social welfare teacher are getting married on a Saturday in 2 years. I keep calling her the social welfare teacher because, um, I don't actually know my fiancee's name. Come to think of it, I haven't seen her at school this week and I am starting to think that she may have no recollection of what she comitted to that unforgettable night of the marathon. I will be devastated as I have already cleared my schedule for all the Saturdays in roughly two years time. Oh well, if that doesn't work out I still have the weekly proposals from my female students to consider. Actually, I don't consider them, but it is nice to know you are appreciated. It is pretty strange having girls say to me, "Dean, I love you." I mean, sure I have a fan club at home, but the only thing that both of the members say to me is "Dean, when are you going to pay us for joining your fanclub?" Ungrateful swine they are. Alas, I digress. Anyway, the fact that the Japanese think most white people look the same (how ironic is that) has really helped me in convincing them that I look just like Tom Cruise. Mwahahaha ... suckers! There is one more thing that I wanted to mention. I am trying to adopt a little girl that I met whilst at the drinking party (being 3 years old she was not allowed to consume any alcohol and was, in fact, not part of the drinking party). You see, at this restaurant each party gets their own little room. There is also a room where children can go and play and this room happened to be visible from our room. I was also seated next to the door so it did not take long for the kids and I to notice each other and to start making faces (which I am convinced is the best way to start a relationship). Before too long the children were bringing us gifts, mostly stuffed Winnie the Pooh bears (he is called Pooh-san here and has achieved a staggering level of popularity in this country). Anyway, the three year old girl had brought me 4 pooh-san dolls and I jokingly asked for one more. Within minutes I had a collection of 15 pooh-san dolls and was nearly suffocating under the weight of them all. After the little girl lost me under the pile she proceeded to redistribute the dolls to each of my dining companions and it was a very sweet scene. Despite this apparent rejection, I was still her favorite and I have decided to adopt her. I don't know what her parents think of it, but I am sure it won't be a big deal. I'll let them babysit from time to time if they really want to. Anyway, that is all for now. Please feel free to leave comments (actually, you should feel obliged to leave comments because you haven't done so before - no more of this feeling free garbage). Seriously, while I do keep up on some of the important things back home, namely the NHL, I really need to hear from you. I am also fishing for reasons to keep writing these punishingly long blogs (punishing for you, that is). Oh, I would also like to point out that I am indeed wearing a courderoy blazer in the picture and I am desperately searching for some leather to patch up those elbows. Even if I am not a real teacher I can sure pretend to be one. Damn it, damn it, damn it! I knew it, sooner or later someone would have to snag ya again engagement-wise. Have I mentioned DAMN!? 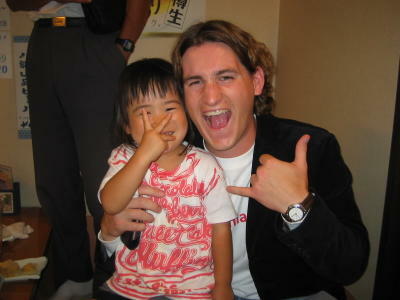 Once we start seeing CNN-footage with Japanese doing the hang-loose sign, we'll know you've taken over Japan. Also, I think it's strategically sound to start with the little ones and work your way up to the great-great grand parents. Smart that. Darn cute in the picture. Not you in your blazer. The kid, the kid, of course I just mean the kid. Sheesh ... I think I should go back to bed ... with my fever and all. BTW, the YouSendIt thing is still not working .. help? And I really do like the 4 songs I've been able to listen to so far. If you haven't checked out http://earth.google.com/ yet, you really should! I have a feeling you’ll enjoy it. And a big "Hi!" to Danielino, the second reader of your blog ;) Well, I think I just got you partially back .. with the long and the boring, that is. Yeah, sorry about that to THE other READER - but you did have a choice not to start reading the comment in the first place, my friend. Peace out and hang loose! It's so funny to read your stories. Tom cruise...try Elvis Stoyko...You got as much chance of looking like Tom Cruise as I do of looking like...Jackie Chan (that guy's fabulous)! That teacher in the picture with you in the cord jacket looks really young...you're gross! Lei é Bella!!!!! Congratulations for your engangement...ah, by the way, is it normal wait for the woman 20 years in Japan????? Dean you are a wiener. That is all. P.S. You clearly look more like Christian Bale. Too funny brother! Well if the e-mail title was to get a lot of people to your blog. It sure did work! But i'd like to think that i maybe one of those 2 faithful readers,right? lol.... Hmm i dunno about Tom Cruise but we'll give you the height. That kid is so cute! You should definitely adopt her! oh and you're alright too in the picture. So does this mean that i also have to clear all my Saturdays for the next 2 years??? Love the hang loose sign. I'd love to visit you and see your home town doing it! hey it's great to hear you stories and mostly the way you tell them! All the best in all you do! And yah i couldnt believe that you did not even use the "knee" as an excuse not to run! A true heart breaker.. Dean you a a total prick, leaving this fake diamond ring on my finger and taking your heart away from the dreams and promises you made to me. Did I mean anything to you? Looks like a few hearts strings are being pulled by the hearts you've left behind. We're off to England in less than 24 hours but do continue to appreciate the updates from Japan. your giving me a near heart attack is worth some cooking when you get home you think. you are well missed Dean. Just so you know, I'm not coming to your wedding because I can't stand to know that some *other* random asian chick has stolen my backup. And you gave julie a fake ring too? i'm hurt. deep down. Player. It hurts so much i'm choking. really. So, what was I saying? No, not Tom Cruise. Maaayybe Christian Bale..but dude: DARYL SUTTER! (when you're 80). okay, maybe Elvis Stojko (did you know he's from Richmond Hill?). or Sean Penn. Am i being mean? All in all, it looks like your little enticement email worked to bring numerous commenters to your blog. i meant 'juice'. not julie. oops. Despite your short memory I hope you always remember this period in Japan....you seem so happy! I ask to everyone: why in Italy there isn't a Dean's fan club?